This unit offers an alternative application for high-resolution topographic data from an outcrop. Using engineering geology methods and data collection from TLS and/or SfM, students design safe "road cuts" with low probability of failure for a proposed fictitious roadway along the side of a hill. Cut slopes or "road cuts" are constructed slopes along roadways in mountainous regions. The design of such slopes requires a safe slope angle, rockfall catchment ditch, and drainage provision. The decision of the slope angle is based on kinematic analysis for slope failures due to the orientation of discontinuities (bedding planes, joints, etc.) with respect to that of the proposed slope. Traditionally, discontinuity orientation data are collected from measurements directly on the outcrop. This can be dangerous and the accessible sites may not be fully representative of the cut as a whole. Remote methods such as TLS and SfM generate 3D models from which discontinuity data can be collected safely. In this unit students learn the workflow for designing safe cut slopes using discontinuity data collected from direct field observations and TLS or SfM and compare the methods and results. 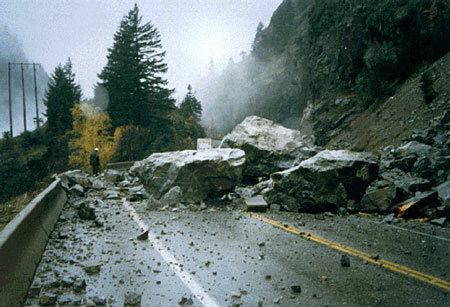 Rockfalls from steep hillsides frequently disrupt road traffic in the mountainous regions of British Columbia, Canada. Image provided by Natural Resources Canada via Wikipedia. Perform kinematic analysis based on discontinuity orientations and slope azimuth. Cognitive: Promote student ability to integrate structural geologic, topographic and rockfall trajectory information for designing rock slopes along roadways. Behavioral: Facilitate development of further surveying skills and use of SplitFX and DipAnalyst softwares. The content in Unit 2.1 was designed for upper-level geoscience majors in a course with field components. It can work in a field camp over three days of field collection and data analysis. It can also work in an academic year course such as engineering geology, structural geology, applied geophysics, remote sensing/GIS, geomorphology, or field methods. It can be conducted over approximately one lecture (introduction to geodesy to study cut slopes) and two labs (conducting a small survey of a feature, exploring and interpreting the collected data). Another option is to collect data during a one- or two-day field trip, followed by data processing and analysis during subsequent class periods. If a LiDAR scanner or SfM collection platform is not available, this may be used in a classroom setting with a prepared data set. The material works well with SfM for a group of approximately thirty (or fewer) students in groups of two with an instructor and teaching assistant/s. If you use TLS, it is ideal to have not more than 12-16 students, as they can break into four teams of 3-4, which means each feature will have four scan positions (doable with a group of students in eight to ten hours) and gives each student time for hands-on scanner time. The number of students is more flexible using SfM, as data may be collected using a variety of cameras at the same time so many students can have hands-on data collection time. If both survey techniques are being used, larger classes can be accommodated but an additional teaching assistant might be helpful. Prior student experience with basic structural geology concepts, topographic maps, trigonometry, and basic calculation skills is expected. Students also need to have prior experience in discontinuity orientation data collection (strike, dip direction, and dip) and plotting structural data on stereonets. More details of designing and conducting TLS and SfM surveys are covered in Unit 1-TLS and Unit 1-SfM. Unit 2.1 can be taught as the first exposure that students have to these methods or after doing a Unit 1 exercise, but the instructor should review the Unit 1 resources before teaching Unit 2.1. Unit 5 is the summative assessment for the module. Through the Unit 2.1 Road Cut Design Student Exercise (Microsoft Word 2007 (.docx) 1.8MB May8 18) , this unit introduces students to rock slope stability analysis using both high-resolution remote sensing (SfM or TLS) and traditional outcrop mapping. They also build their spatial reasoning skills through topographic surveying. The instructor provides a hypothetical route for a proposed road. The task of students is to put forward slope design recommendations in the form of cross-sections showing the proposed slope angles and sites of mid-slope benches/rockfall catchment ditches that would result from excavations to build a road. To do the full project including both field data collection and high-resolution topography (SfM or TLS) takes three days. Students can be broken into groups of two for most of the exercise. Teams of four may be needed for TLS scanner time, unless you have a very small class. Topographic surveying – students take elevation data with Jacob staff and transit compass in order to generate topographic profiles and a rough topographic map. The topographic map will be used to draw longitudinal sections and cut slope design cross-sections. Although this step is not, strictly speaking, necessary if published maps are available, it has proven valuable for increasing student understanding of survey measurements and coordinate systems. 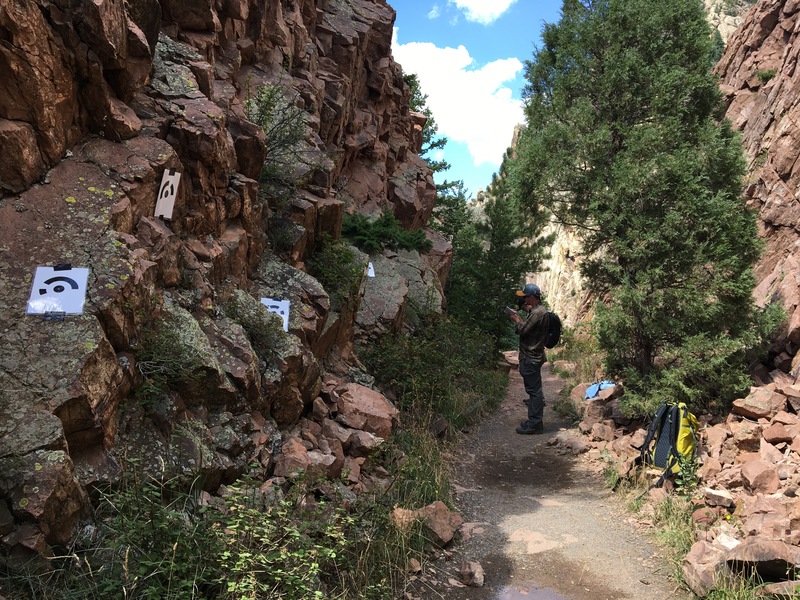 Traditional Outcrop Mapping - students collect discontinuity data in the traditional way using dip and dip direction as measured by a compass and then to perform kinematic analysis to recommend safe slope angles. Point Cloud Data from SfM or TLS - students generate point clouds and then use them to derive discontinuity data, as an alternative to direct outcrop measurements. Extracting discontinuity data from point cloud using SplitFX software (high-resolution point cloud generated by TLS/SfM survey). Thirty-day trial licenses for SplitFX can be requested. Kinematic analysis to determine most likely failure planes using DipAnalyst software. Free educational licenses for DipAnalyst can be requested. Produce safest topographic survey for the proposed road and compare and contrast manual and remote sensing methods. 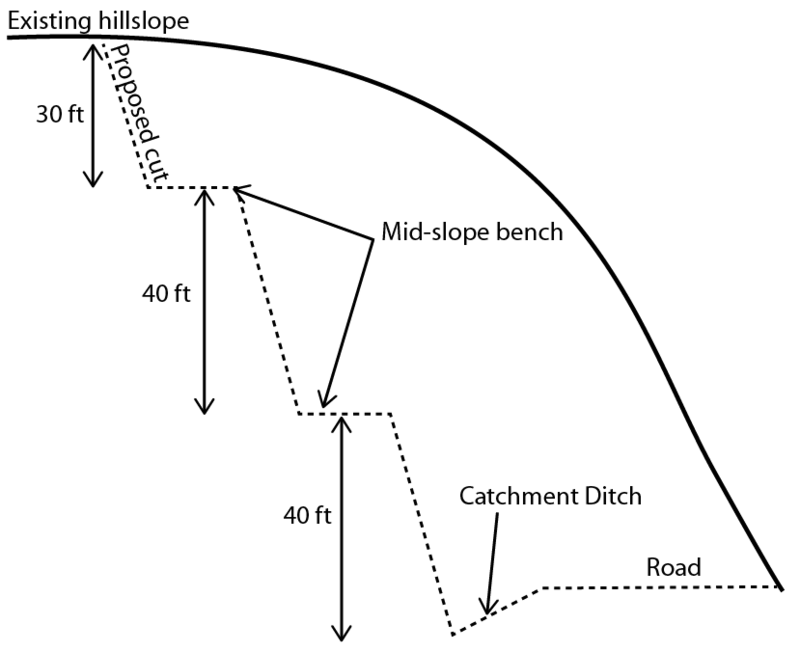 Profile-view line drawing of schematic design for rock benches and catchment drainage of a road cut. A cut slope design, an example of which is shown here, mainly includes reasonably safe cut slope angles and slope benches/catchment ditches. Slope angles are selected based on kinematic evaluation of rock discontinuities with respect to the proposed slope aspect and angle. Therefore, it is necessary to collect discontinuity orientation data and also survey the topography within a 60-100 meter buffer zone around the proposed roadway median. The width of mid-slope benches and catchment ditches are based on rockfall trajectory studies. Map view of a hypothetical proposed road path and the topographic cross-profiles that students should generate. The instructor should select a route for the proposed roadway (see below for tips on good sites). The selected site should have a topographic relief that will require cutting the existing natural slope to build a nearly level roadway. Mark the median of the proposed roadway on the ground by placing stakes every ~100 m along route and recording elevations using a GPS unit. On Day 1, students should find the stakes and perform a topographic survey for 60-100 m along profile lines originating from each ground stake perpendicular to the roadway. For each profile, students should work out from the proposed road center, first in one direction and then in the other. Students will use their Brunton compass and a Jacob staff (or equivalent) to calculate elevation every ~20 m (using the elevation of the stakes marking the road as reference). Introductory presentation on cut slope design and conducting topographic surveys. Demonstrate topographic survey using Brunton compass and a Jacob staff (procedure is in the student exercise document). Provide students elevation values (from GPS) at each stake. Make sure students know to record relevant data: linear distance and vertical angles on field note book. Walk the students along the hypothetical road route with the stakes placed by the instructor and overview how to do simple topographic surveys (using their Brunton compass and a Jacob staff). Students should then surveys topographic profiles for ~60-100 m in either direction from each ground stake. 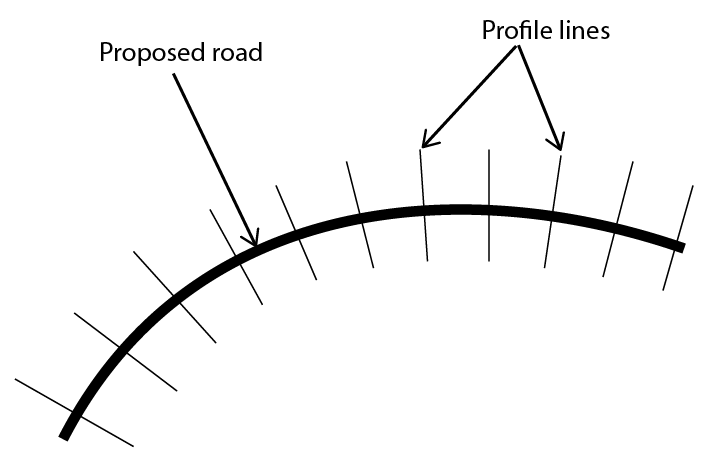 The profile lines should be perpendicular to the hypothetical roadway. Review how to calculate elevation values based on linear distance between two points and the vertical angle. Show students how to construct a longitudinal section which is a topographic profile along the median of the proposed roadway. Instruct students to also show the road level on the longitudinal section. Students should allow a maximum of 6% gradient (slope of 0.06, 3.43°). 1) Topographic contour map of the roadway area (within the limits of the profile lines) surveyed. Note: If students need more time allow them to turn it in the next day. Students should use 11x17" graphing paper. 2) A longitudinal elevation profile section along the proposed roadway showing the proposed road level (allow a maximum of 6% road gradient). Note: Students should use 11x17" graphing paper. Kinematic analysis of rock slopes. 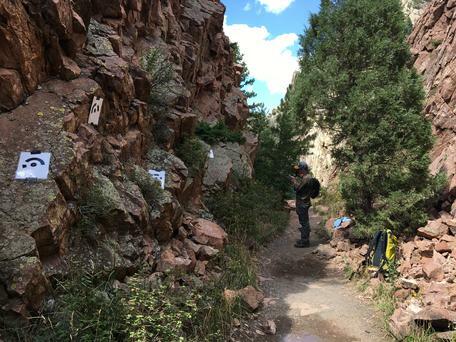 What students should record in field notebook: Outcrop#, Lithology, Formation name, Type of discontinuity, Dip, Dip direction, Aperture, Continuity, Water flow, and Spacing. Instruct the groups from Day 1 to locate two outcrops (in the vicinity of the proposed roadway) and collect discontinuity data (orientation, type, aperture, continuity, water flow, spacing) for at least 100 discontinuities. They will mainly be using orientation data for the project but it is a good practice to learn rock mass characterization. Plotting discontinuity orientation manually and using software. DipAnalyst is the software described in this unit. Other options include RockPack III by RockWare or DIPS by Rocscience. Performing kinematic analysis using DipAnalyst software. Kinematic analysis results summary write-up with attached stereonet plots showing poles to discontinuities, slope, and a friction angle using software (DipAnalyst, RockPack III, DIPS). Each stereonet should represent expected slope aspects based on the orientation of the roadway and a slope angle of ~85°. For each expected slope azimuth, state the possible type of failure (plane, wedge, toppling) and an optimum slope angle that would minimize slope failure potentials. Structure from motion photogrammetry (SfM) and/or terrestrial laser scanning (TLS) basics if the students have not already learned the method/s. (See Unit 1-TLS and Unit 1-SfM for resources). How to generate point cloud using SfM and/or TLS and generate discontinuity data using SplitFX. Instruct students to watch the tutorial videos for SfM - Agisoft Photoscan Pro tutorial (MP4 Video 21.8MB Mar8 17) and Engineering analysis - SplitFX software tutorial (MP4 Video 44.7MB May10 17) or read prepared manuals and/or short user's guides (see below). Agisoft-produced targets are one way to establish ground control points during an SfM survey. Have the students collect data for SfM and/or TLS using methods described in Unit 1. Students should obtain local coordinates for the SfM targets using a Brunton compass and measuring tape. Students should select a local origin (0, 0, 0) and record distance, vertical angle, and bearing from the chosen 0, 0, 0 point. Process point clouds from SfM photos (or receive TLS point cloud data from a field engineer). Use SplitFX to determine discontinuities from the point clouds. Use DipAnalyst to perform kinematic analysis. Construct slope design cross sections for selected 3-5 profile lines that will show current topography and the proposed slope cut (see cut slope diagram above for an example). Students complete kinematic analysis using point cloud–generated discontinuity data and write a few lines discussing differences and similarities in using manually collected data for kinematic analysis. Detailed cross section for each selected profile also showing the slope design profile (similar to what is shown above). Note: Students should use 8.5x11" graphing paper. 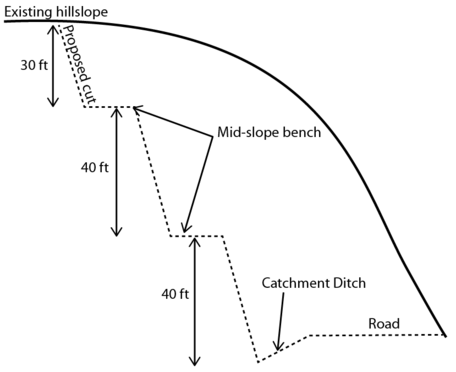 Justification of proposed slope angles (based on kinematic analysis), mid-slope benches and catchment ditches (based on rockfall charts by Pierson (1991). For example, one can justify gentler slope angles that result in less slope failures and narrower catchment ditch or steeper slope with wider catchment ditch. Overview of rock slope stability analysis concepts and making simple topographic profiles. General guides to using the software for data exploration and some processing; applies to all units, including 1, 3, and 4. Agisoft PhotoScan creates point clouds from sets of overlapping photographs. Versions available for Windows and Mac. SplitFX engineering software extracts discontinuity data from point clouds. Windows only. DipAnalyst performs a kinematic analysis of rock slopes based on known discontinuities. Windows only. DipAnalyst analyzes the potential for the various structurally controlled modes of rock slope failure (plane, wedge, and toppling), as well as calculating factor of safety values against plane and wedge failures. Engineering software that takes point clouds as input and identifies structural discontinuities along which failure is more likely. This workflow document was developed by UNAVCO for TLS field engineers using Riegl VZ400 scanners. It is largely applicable to several other Riegl scanners. While additional training and experience is needed to independently run a Riegl scanner, it can be a useful reference for instructors to understand the basics of Riegl scanner operation. If updates are published to this document, they will be available on the UNAVCO Knowledge Base (search "TLS"). Applies to all units. Set of 26 photographs from Eldorado Canyon, Colorado that can be used for a road cut design exercise. Each student group needs at least one transit compass and a 30-meter measuring tape in order to complete the topographic surveying. This exercise is written for a fairly low-relief area. If your field area is steep to the point of having very limited access, it may not be possible to do this Day 1 exercise. Alternatively, you could have students use a laser range finder to generate distances and angles to generate profiles. Computer power can be a significant limiting factor when using Agisoft for SfM analyses, particularly at field camps without computer labs. Student laptops will have a variety of speeds and capabilities. I found that having students use 10-15 photos per outcrop and only generating a low-density point cloud helped with this issue and was still sufficient for the discontinuity analyses. 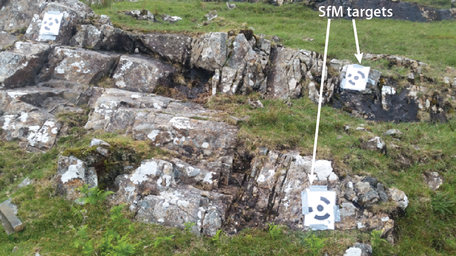 Student sketches SfM target locations on a sandstone outcrop. Well-bedded sandstone with joints can provide a particularly good place for students to first learn these methods. You will need to identify a real field site for which the students will design the hypothetical roadway. The best type of outcrops have easily identified and fairly consistent discontinuities (beds and joints). Strongly bedded sandstone, quartzite, or limestone work particularly well. A well-jointed granite can also be good. Inclined bedding usually offers more interesting analyses than flat-lying beds. Shales can be more difficult, as the discontinuities are usually not as pronounced and consistent. It is always best to test how the point cloud data work before trying the site with students. You can choose an outcrop away from existing roads where they should design a "new" road cut or one along an existing road or trail for which they are supposed to do a "widening" project. Give the students an overview map with the hypothetical roadway they will be developing drawn on it. Calculating the x-y-z coordinates of SfM targets was also a good method to explain x-y-z points in space. Students are so dependent on technology and had little or no understanding of coordinate systems. Although the tutorial videos and in-depth manuals are more comprehensive, students are really glad to have the quick guides for easy reference. The final road cut design may not be identical from one group to another. One group may design slopes with gentler slopes to minimize failure and provide a narrower rockfall catchment ditch. Another group may justify steeper slopes with wider catchment ditches. Students may also suggest slope-stabilizing methods such as rock bolts or wire meshes for steeper slopes. The important concept is being able to justify the proposed design. Much of the formative assessment can be done through observations of and discussions with students individually, in pairs, or periodically in the whole group. Students may also hand in their work from the field, including field notes (atmospheric conditions, metadata) and sketch of survey setup. 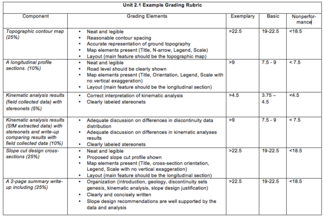 The work for formative assessment could be graded based on completion. Summative assessment for Unit 2.1 is based on the completed student exercise, which includes details of their survey design and interpretation of the collected data. 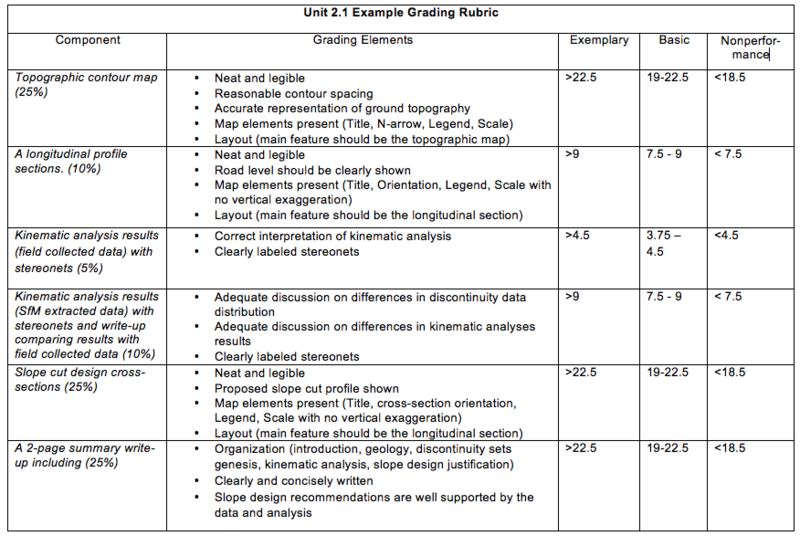 An assessment rubric is included in the student exercise. Summative assessment for the module as a whole will be evaluated at the end of the module in Unit 5. If students complete just Unit 1 and Unit 2.1, the Unit 5 topics we recommend that you choose from are "geologic outcrop with visible faulting" or "sequence stratigraphy." Borradaile, G., 2003. Statistics of Earth Science Data, Springer, New York, 351 pp. Goodman, R. E., 1989. Introduction to Rock Mechanics, John Wiley & Sons, New York, 562 pp. Hoek, E. and Bray, J. W., 1981. Rock Slope Engineering, 3rd edition, The Institute of Mining and Metallurgy, London, England, 358 pp. Pierson, L. A., Gullixson, F.C., and R.G. Chassie, 2001, Rockfall Catchment Area Design Guide Final Report, SPR-3(032), Oregon Department of Transportation, 92 pp. Piteau, D. R. and Martin, D. C., 1977, Description of Detail Line Engineering Geology Mapping Method; in Rock Slope Engineering, Part G: Federal Highway Administration, Reference Manual FHWA-13-97-208, Portland, Oregon, 29 pp. Watts, C. F., 2003. ROCKPACK III, Rock slope stability computerized analysis package. Part one—stereonet analysis. User's Manual, Radford University, Radford, Virginia, 27 pp.